This is a superb Grade II listed detached cottage of great charm, parts of it dating back to the 1600s. 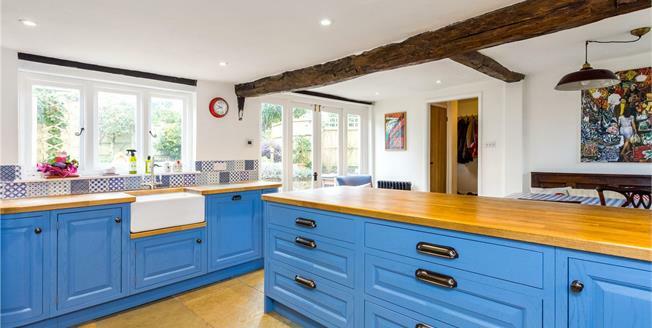 The house is finished to a high standard whilst retaining its original features and character. On the ground floor there is a sitting room with brick open fireplace as well as a study that also serves as an occassional bedroom. A highlight of the cottage is the open-plan kitchen/dining room which is appointed with a stylish selection of blue and white units complemented by solid wood worktops and a Belfast sink. To the first floor, and also of particular note, is the generously proportioned master bedroom with dressing area and en suite shower room. There are two further bedrooms and a family bathroom with feature freestanding bath tub. An internal inspection is strongly encouraged. The delightful village of Ropley is situated some 11 miles north east of Winchester city centre, with the cottage enjoying a central position at the heart of the community, a short walk from the church, the primary school and the village store and Post Office. More amenities can be found in Alresford (4.5 miles) and the cathedral city of Winchester, where the lively centre offers a theatre, cinema, leisure centre, museums and many restaurants, bars and shops. The A3 and M3 provide excellent road access to London and the national motorway network, while rail services into London Waterloo run from both Alton (10 miles) and Winchester (11miles). The area is also exceptionally well served with a wide choice of state and private schools for all age groups. Situated in the very heart of Ropley village, the property occupies a corner position with high hedges providing a good degree of privacy. To the side of the house there is a gravel parking area with space for one car (with further parking available on Church Street accessed by the side gate) and a pedestrian gate under an arbour provides access to the garden via a paved path. Access to the garden from the cottage is via a side door and patio doors from the kitchen, which open onto a paved patio area with steps leading up to a level lawn enclosed on three sides by wooden panel fencing. There are a number of beds with a variety of well-established shrubs and trees. The garden also features a second patio area and a large timber shed. Mains water, private drainage, electricity and Oil fired central heating.